Over the past four years, as Michigan’s startup ecosystem has evolved, so too has the Hacker Fellows program. 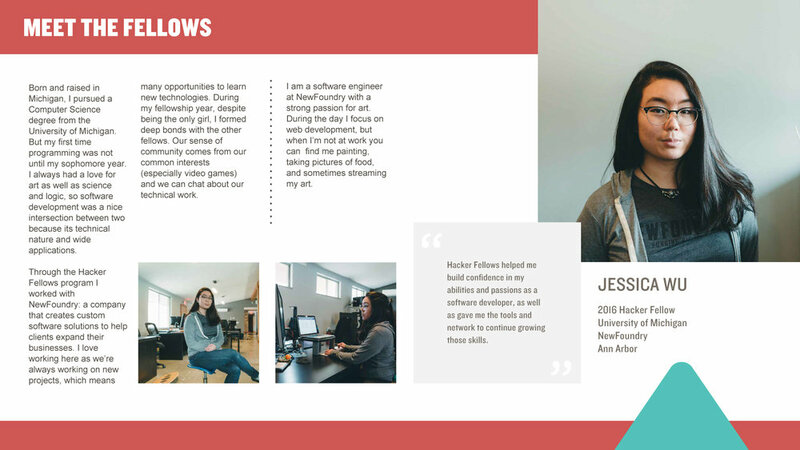 As we’ve grown the Hacker Fellows program to its fourth year, and now have a community of 77 new companies connected to the program + the 80 extremely talented, young developers who are part of the program, we’d like to share with you data and information that was collected from the first three years of Hacker Fellows. Together, we’ve supported burgeoning tech talent and emerging tech startups in a way that has truly contributed to the growth of our entrepreneurial community. We hope that as you review our 2015 - 2017 Progress Report, you take pride in knowing that this is an impact we have all created. Thank you for your participation, support and interest in the Hacker Fellows program, as well as cultivating tech talent, and supporting Michigan’s startups.